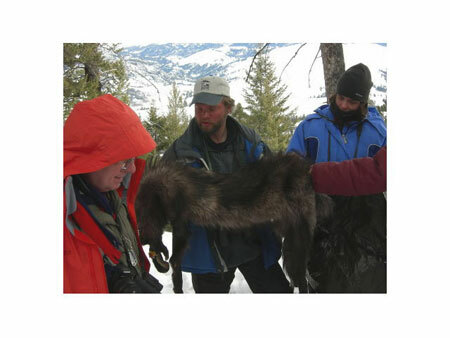 Kudos to Sean Reichard for keeping us up-to-date on various Yellowstone issues! 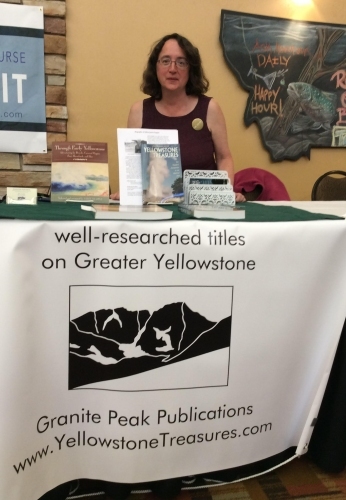 First, I was glad to learn from yellowstoneinsider.com that Superintendent Dan Wenk will not be leaving Yellowstone soon, as reported recently. He has been doing an excellent job. I was privileged to meet him during a January 2012 Tauck Tour of the Park. Today, I learned from Sean that as of June first, 2018, not only will the fee to enter either Yellowstone or Grand Teton go up from $30 to $35 (good for one week), but one can no longer buy a joint annual pass to both parks. At least, we can be thankful that after strong negative reaction from the public, the fees did not rise to the originally proposed $70. Geyser watching as family sport—beats TV! Comments Off on Geyser watching as family sport—beats TV! Here is an excerpt from an article in the February/March 2018 issue of The Geyser Gazer Sput that went straight to my heart. This family,the Altstidl’s, lives near the Bavarian Alps. GOSA: How long have you been geyser gazing? The parents first fell in love with Yellowstone in 1994 and so decided to return in 1997 with the twin boys. They were only 13 months old, but not too young to enjoy Echinus Geyser. Since 2001, we have been coming back to this beautiful place every year and, with time, developed our passion for geysers. While waiting for our first major geysers like Grand and Great Fountain, we were taught about the things to look for by a lot of very helpful and friendly people and learned they were part of the GOSA community. We began subscribing to the Geyser Gazer Sput in 2007 and have enjoyed being part of the community ever since. GOSA: How did your family begin geyser gazing? Initially, we used the predictions provided by the National Park Service. We still remember waiting for Madison VC to open on our way from West into the basin to get some information and plan our day. Those were the days before we had the Internet! With the children still in a stroller we already tried to wait for at least Echinus, Daisy and Grand. We were so lucky that the boys were very patient. But I think what really got us hooked in the first place was the nice atmosphere while waiting for Great Fountain. The anticipated eruption with sparkling diamonds combined with blue at the bottom just took our breath away. It was there where Jeff Davis and Lynn Stephens started teaching us where to look to make our “own” predictions and told us about other geysers not predicted by the NPS like Fountain and Artemisia. After that we got “fireworks” at Grand; rainbows at Beehive; thumps at Oblong; playful, never tiring Fountain; mystic, blue-green Artemisia; soaking, funny Fan and Mortar; and graceful, blue and high Morning. So many eruptions which brought us joy and delight, but also the feeling of awe and gratefulness. We always saw something new or interesting. Attached to almost every geyser are memories of people sharing knowledge and giving advice. Such an openness, especially towards foreigners, was what made it special and we feel like part of a huge family now. Excerpted from The Geyser Gazer Sput, Vol. 32, No. 1, February/March 2018, by permission of editor Pat Snyder. Photo credit: Beth Chapple, June 23, 2013. I’ve been privileged to see eruptions of all ten of the wonderful geysers mentioned here, even though I get only a very limited time in the Upper Geyser Basin each summer. 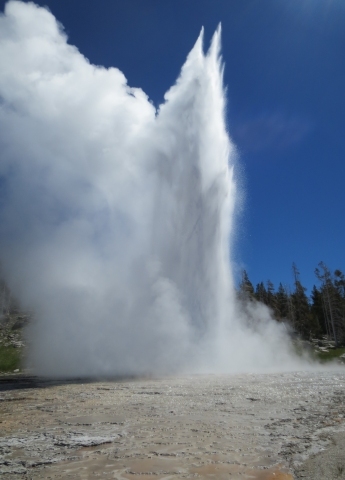 The Altstidl’s mention of their children being patient reminds me of how my then-six-year-old granddaughter Lexi made no complaint about our hour-long wait for Grand Geyser to erupt; perhaps small children sense that something wonderful is about to happen. You, too, can become a member of the now thirty-year-old Geyser Observation and Study Association. Write c/o Bill Johnson, PO Box 5031, White Rock NM 87547; email store@gosa.org; or sign up on the website: www.gosa.org. The National Park Service has announced a proposal to charge larger fees for seventeen of its most popular parks, beginning next spring. I learned about this through the excellent KQED California Bay Area radio program, “Forum,” and considered registering a comment with the NPS. Considering the dire condition that many of our parks are now in due to underfunding by the federal government, it probably makes sense to raise entrance fees for people who are actually using these parks, especially during the busiest seasons (May through September for Yellowstone). A caller to the program brought up the subject of charging more for people from other countries than for U.S. citizens—a thought that had also crossed my mind while I was listening. 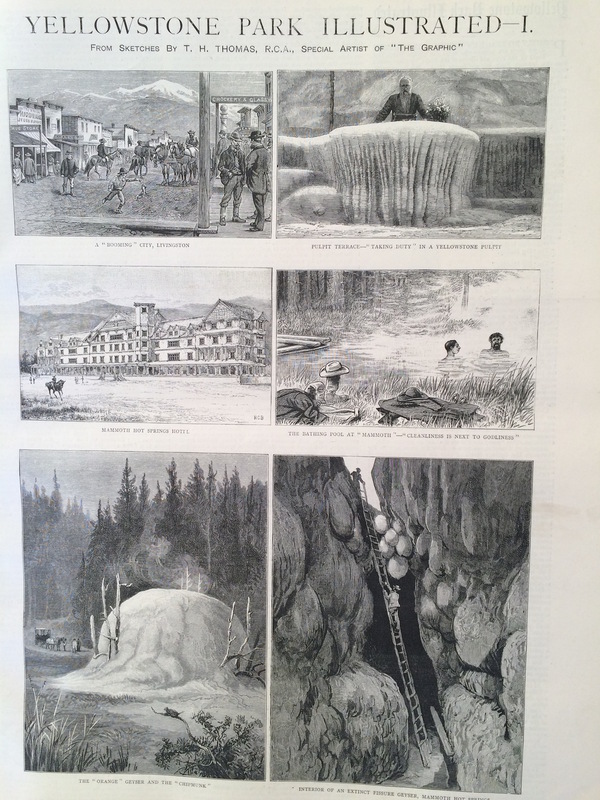 After all, when Congress passed the 1872 act setting aside Yellowstone, the very first national park in the world, they stipulated that it was “for the benefit and enjoyment of the people,” and chances are they were thinking of American people. Whether or not charging more for foreign visitors is a good idea (and I’m not sure it is), that is not a consideration included in the present proposed fee change. Decide for yourself whether this fee hike would be a wise move by going to: [link] the NPS website. Today is the first day you can drive into the park from the North or East Entrance. What’s more, those of us stuck at home can now get predictions of the daytime eruptions of Old Faithful Geyser on the NPS website. But, if you are anything like me, you are mostly celebrating that the time for your summer trip to this wonderful park is drawing nearer. Just one thing that may give us pause as we contemplate the sights we are anticipating seeing: the crowds are likely to be amazingly large. Here are links to a University of Montana report (2.7 MB pdf file) on 2016 crowding in that state’s two national parks and a shorter summary of the report, emphasizing Yellowstone, by Sean Reichard of YellowstoneInsider.com. If you should happen to be one of the people driving into Yellowstone this weekend, you may want to take part in tomorrow’s Earth Day Walk for Science at Old Faithful. This echoes the Washington, DC, Walk for Science. As an ever-curious non-scientist, if I lived anywhere near the park, I would certainly want to participate in that. Trains to Yellowstone? Oh, for the days . . . Comments Off on Trains to Yellowstone? Oh, for the days . . .
To my mind this is a strange question, but perhaps the person asking it does not know where trains do and do not run in the U.S. It would be great if there were still trains to one or more of the entrances to the park. However, the last passenger train, the Northern Pacific, to terminate at Gardiner, Montana (the North Entrance) arrived with a passel of Girls Scouts in 1955, and one could only get as far as Livingston on a train up to 1979. The other railroads that took passengers near the park had stopped running trains to the vicinity of Yellowstone even before that. Your present options are taking a tour bus, flying to one of the gateway towns that has an airport and renting a car, or driving in your own car, which people do from every state in the Union. Personally, I would think it high time that railroads reconsider the possibility of building tracks back to Gardiner, Cody, and/or West Yellowstone. The National Park Service should then set up shuttle buses to all the major points of interest—if only there were money for such a dream to come true any time soon. . . . 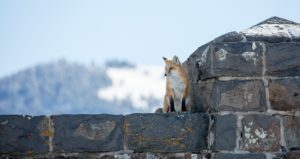 This fox was spotted tracking a snowshoe hare from atop the Roosevelt Arch at the North Entrance earlier this month. Let’s take a breather from the national news scene to look at the amazing popularity of Yellowstone Park in 2016. The National Park Service office has recently announced record visitation for last year: 4,257,177 visitors came through the gates, up nearly 4 percent over last year’s record. Their January 17th press release attributes much of this huge influx to the number of commercial tour buses—12,778 last year. It’s wonderful to know that people from all over the world are able to travel and enjoy Yellowstone’s wonders, but limits on numbers or timing of visits probably need to be set up to conserve natural resources and keep the park beautiful. Since the NPS is obliged by law to preserve the parks “for the benefit and enjoyment of the people”—as well as to conserve their natural resources—officials are pondering ways to carry out these sometimes opposing obligations. Way back in May of 2011, I developed a plan for a shuttle system on the west side of the park. Unlike a park such as Zion, which essentially has one central road, the figure-eight system of park roads in Yellowstone does not lend itself well to shuttles, but having only the most-traveled west side accessible by shuttle and creating incentives to encourage able-bodied visitors to use them would help the congestion. As someone who has enjoyed the park for over three-quarters of a century, I don’t want us to love it to death! All campgrounds close in September, except the one at Mammoth Hot Springs, which is open all year. Almost all roads are open until November 7; Dunraven Pass and Beartooth Pass close on October 11. Since the weather always turns cold and snowy more and more during October, visitors need to be prepared to dress warmly and could need snow tires in some areas. All thermal areas and most wildlife can be seen (bears are just beginning to think about hibernating), but visitor center hours are limited, some dining facilities are closed, and ranger programs have already ceased in September.